MILWAUKEE – (April 13, 2018) – Johnson Controls is pleased to announce that the iotega security and lifestyle management hub has been honored with the Best New Product Award in the Intrusion Detection and Prevention Solutions Wireless category. 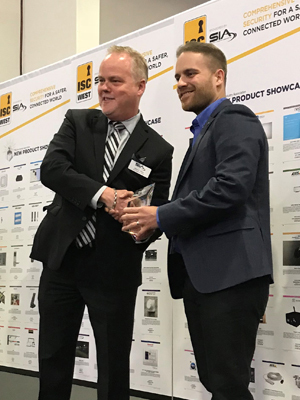 The award was presented at the 2018 SIA New Product Showcase, at ISC West in Las Vegas. Sponsored by the Security Industry Association, the annual awards program is one of the most prestigious recognitions in the security industry. This year 122 products were entered into the awards program which announces winners in specific product and service categories, in addition to awarding its prominent Judges Choice and Best New Product Awards. iotega is a tabletop device that enables installers to offer customers a robust security solution as well as the opportunity for future upgrades to an automation platform with additional devices. Easy to install, iotega features PowerG technology with 128-bit AES encryption, adaptive best path technology to ensure the best wireless signal transmission as well as frequency hopping spectrum technology. As an intelligent full premises management solution, iotega allows end-users to view cameras, lock doors, adjust temperature, switch on/off lights and enables a wide range of other home automation features. For more information on iotega, please visit www.dsc.com or visit the Johnson Controls at ISC West in booth 20005.